As a content creator, you’re likely worried most about the quality of your content. While quality is extremely important, ensuring that your content is seen by as many people is equally vital. You may be focused on the art that goes into creating your content, but you also need to be aware of all of the work that is necessary after your video is finished. That is arguably the key to a successful video campaign. Our entire business has been built on helping content creators easily create content and share it with the world, through a robust distribution network. Over the past decade, we’ve built a content delivery network that rivals any content provider online. This rock solid infrastructure has allowed us to grow our business consistently, and as of late, we’re seeing a surge in our IPTV business. It’s hard to go more than a day or two without hearing a story about how online providers like Netflix, Amazon and Hulu are growing at astronomical rates. If you’re not familiar with these providers, they offer a variety of online content that can be accessible from TVs as well as smartphones and tablets, all for an extremely low monthly rates. Many consumers are finding that they can get by with subscriptions from the above-mentioned IPTV providers as opposed to a costly cable or satellite subscription. This titanic shift in how users are viewing video content spells potential disaster for large cable and satellite providers. If you’re a streaming provider looking to promote your own video content, now is a great time to target these viewers that are already accustomed to accessing video content from their TVs through IPTV devices as well as on smartphones and tablets. As we mentioned above, cable and satellite providers are seeing an erosion of their subscribers based on the success of IPTV providers, but also due to inferior technology. One area of frustration for many cable and satellite customers is the programming guide used to navigate through live and recorded content. A number of the interactive programming guides from these companies are extremely cumbersome and slow resulting in added frustration for customers. 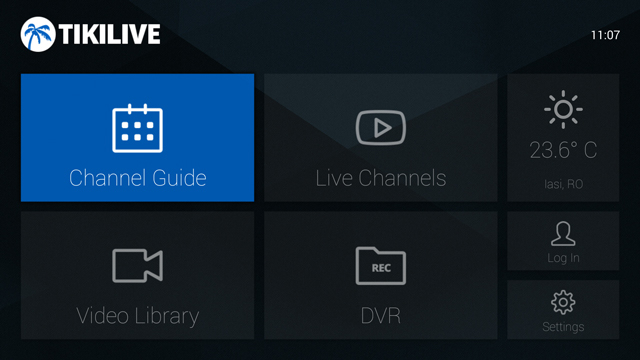 When we set out to design our EPG (Electronic Program Guide), we attempted to take what we learned from cable and satellite companies and added a series of new features never before seen in a program guide. HTML5 Support – If you’re looking to create a variety of scheduled events on your TikiLIVE channel, you should be extremely excited about our new HTML5 support. This will allow you to access your programming schedule right from your mobile phone. Make tweaks to your schedule right from your phone, without having to logon to your computer. Notify Audience of Programming Updates – With TikiLIVE’s EPG software, you can easily notify your viewers of any programming changes by simply changing your event date or time in the TikiLIVE interface. Once you make this change, it will instantly be accessible across all devices. EPG Software Syncs Across Devices – One of the main benefits that our users love about the new EPG software is that you can easily make a change to your programming schedule from any device and it will instantly propagate to your users. In the past, you could not use your mobile for to change the schedule. Now, you have full control over your programming schedule from any device – including a mobile phone or tablet. Encoding in the Cloud – Video encoding can be an extremely complicated and tedious process. For this reason, TikiLIVE has a cloud based video encoding solution that allows you to upload your videos in a variety of formats, which are then converted and optimized in the cloud and made available to your viewers. All you have to focus on is generating top-notch content – not the technical glitches that can halt creativity. Full Mobile Support – Just like our EPG offers full mobile support, all of your content will easily be accessible across all devices including smartphones and tablets. With more people accessing the Internet from mobile devices than computers, reaching this segment of your viewing audience is critical. Excited About Getting Your Streaming Content Online? If you’re ready to get your content online don’t hesitate to contact the streaming pros at TikiLIVE today. We offer a variety of contact options including live chat, email support as well as traditional phone support by calling 305-743-6722.